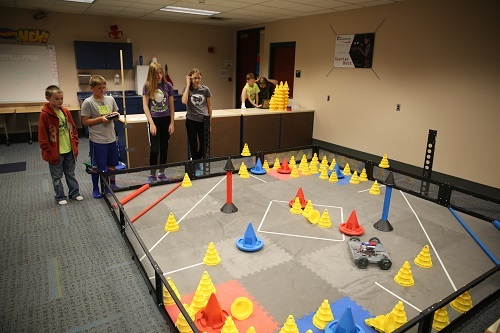 Schmucker is proud to offer VEX Robotics Competition (VRC) club to our students. In our first year as a club (2016-17 school year), we had 12 students on two teams, which qualified for the Indiana State VEX Robotics Tournament in Indianapolis. For the 2017-18 school year, we have grown to 22 students on four teams, and we are determined to earn another invitation! Our students go on to participate in Penn High School’s Robotics Team 135. Our students experience in Schmucker’s VEX Robotics has helped them gain experience to compete on Penn’s award winning Team 135. Penn-Harris-Madison School Corporation has a STEM pipeline in grades K-12. Some P-H-M middle schools now also participate in VEX IQ, the elementary robotics tournament. At VRC tournaments, teams compete against other middle and high school teams in a game that changes each year. Please click here to see an example of competition. We are financially supported by Schmucker PTO, PHM Education Foundation and our own fundraising efforts. We were also very fortunate to have Kendrion Mishawaka (a company that specializes in design and manufacturing of electromagnetic solutions) donate $1,250, which allowed us to cover the cost of building a practice tournament field (see the picture below). Kendrion’s generous donation covered the cost of the field perimeter, tiles, and electronics. These parts of the field are the same each year so this field will be used for years. Without the generous support of the PHM Foundation, we would not have been able to cover the cost of supplies to add a 4th team. We have also received donations from Herrman & Goetz, Inc. ($1,000) and Precision Transmission ($500). Through the generous support of the community as well as P-H-M, this program continues to grow, offering opportunities for more students to become involved in the Robotics field. Click here for information on VRC Team 775 SpartanBots on our Google Site. 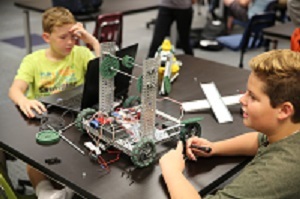 Questions about VRC Team 775 and Vex Robotics can be directed to Schmucker Project Lead the Way teacher Matt Reininga; click here to email Matt Reininga.